In 1982 director Mark L. Lester scored a breakout indie hit with his gritty thriller Class of 1984, a post-punk update of the Blackboard Jungle template, in which a teacher turns to vigilantism to deal with his violent pupils. Eight years later Lester updated the format once more with Class of 1999, this time taking the premise into the realm of dytopian sci-fi, more Circuitboard Jungle than Blackboard Jungle. It's the end of the 20th century and America's high schools have become battlegrounds, as explained in an Escape from New York inspired opening sequence. One such school is Seattle's John F. Kennedy High School, whose principal (Malcolm McDowell) takes the drastic measure of hiring three experimental android teachers in an attempt to restore order. There's walking steroid gym coach Mr. Bryles (Patrick Kilpatrick), dead-eyed history teacher Mr. Hardin (John P. Ryan) and curvaceous chemistry instructor Miss Connors (Pam Grier - if I had a teacher who looked like Grier I never would have been able to concentrate on my work). Released from juvenile prison is former gang-banger Cody (Bradley Gregg), who has decided to keep his head down and avoid trouble. Not so easy in JFK High however, and Cody soon makes an enemy of his new teachers, and begins to suspect their true nature. When the cyber-educators progress from corporal to capital punishment, the school's various gangs decide they best call a truce and battle their new common enemy. It's interesting to return to Class of 1999 in an era when American politics has turned increasingly to the right. The premise of Lester's film - a government that would rather punish the poor than create a fairer society - could almost be a far-fetched critique of the inhumane stance taken by the likes of Donald Trump and current Democratic presidential nominee Kamala Harris. But Lester and screenwriter C. Courtney Joyner display no interest in exploring the potential for political satire in this premise in the way filmmakers like John Carpenter, George A. Romero or Paul Verhoeven might have. This makes Class of 1999 a disengaging watch. Its main problem is how early on it introduces us to the young gang members responsible for the school's bad reputation, establishing them as a group of bullies who prey on the few students who are actually there to learn, only then to later ask us to root for them when they take on the teachers. The victims of their bullying are given no agency, and get to play no part in the third act revolution, leaving us to assume that things are only going to get worse for them once the gang-bangers take back control. A more politically minded filmmaker than Lester might have had the bullies and their prey put their differences aside once they realise their true antagonist is the system that keeps them down. 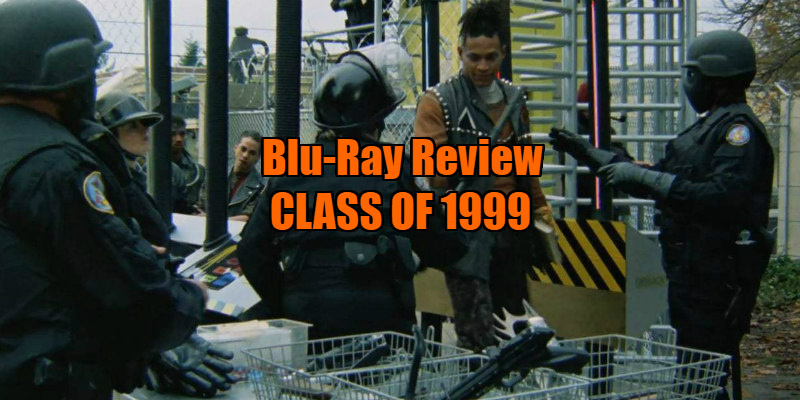 If you're eschewing any political message in favour of simply a fun ride, you need to make sure your movie lives up to that pitch, and sadly Class of 1999 fails to exploit the potential for entertaining exploitation fare in its premise. The action scenes are blandly staged, the three robots are employed too sparingly and the film unwisely opts for a bleak overcast setting rather than the comic book visuals of Walter Hill's The Warriors, the touchstone for this sort of fare. The practical FX look great though, far better on Vestron's blu-ray than on the murky VHS I originally viewed this on back in the day. Feature commentary with director Mark L. Lester; interviews with Lester, co-producer Eugene Mazzola, screenwriter C. Courtney Joyner, director of photography Mark Irwin and special effects creators Eric Allard and Rick Stratton; trailer; TV spots; a vintage promo; and an image gallery. Class of 1999 is released on on Blu-ray as part of the Vestron Collector's Series 25th February.